Northeastern Naturalist 54 C.M. Marroquin, J.O. Lavine, and S.T. Windstam 22001177 NORTHEASTERN NATURALIST V2o4l. ( 12)4:,5 N4–o6. 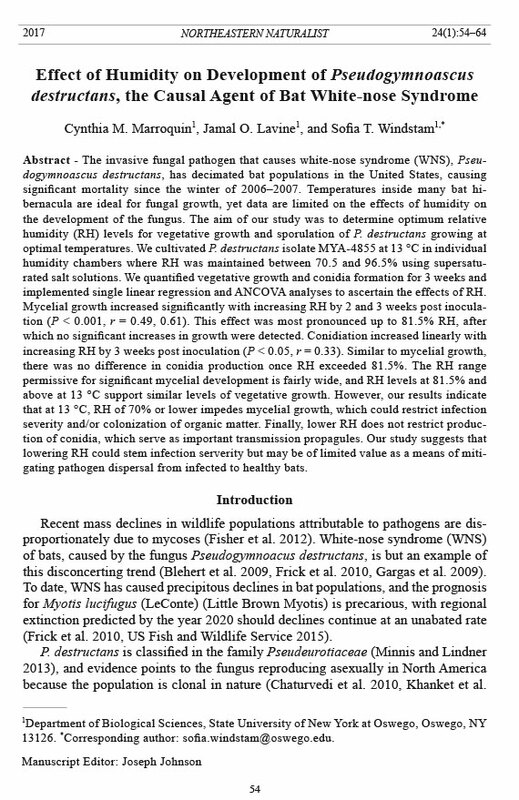 41 Effect of Humidity on Development of Pseudogymnoascus destructans, the Causal Agent of Bat White-nose Syndrome Cynthia M. Marroquin1, Jamal O. Lavine1, and Sofia T. Windstam1,* Abstract - The invasive fungal pathogen that causes white-nose syndrome (WNS), Pseudogymnoascus destructans, has decimated bat populations in the United States, causing significant mortality since the winter of 2006–2007. Temperatures inside many bat hibernacula are ideal for fungal growth, yet data are limited on the effects of humidity on the development of the fungus. The aim of our study was to determine optimum relative humidity (RH) levels for vegetative growth and sporulation of P. destructans growing at optimal temperatures. We cultivated P. destructans isolate MYA-4855 at 13 °C in individual humidity chambers where RH was maintained between 70.5 and 96.5% using supersaturated salt solutions. We quantified vegetative growth and conidia formation for 3 weeks and implemented single linear regression and ANCOVA analyses to ascertain the effects of RH. Mycelial growth increased significantly with increasing RH by 2 and 3 weeks post inoculation (P < 0.001, r = 0.49, 0.61). This effect was most pronounced up to 81.5% RH, after which no significant increases in growth were detected. Conidiation increased linearly with increasing RH by 3 weeks post inoculation (P < 0.05, r = 0.33). Similar to mycelial growth, there was no difference in conidia production once RH exceeded 81.5%. The RH range permissive for significant mycelial development is fairly wide, and RH levels at 81.5% and above at 13 °C support similar levels of vegetative growth. However, our results indicate that at 13 °C, RH of 70% or lower impedes mycelial growth, which could restrict infection severity and/or colonization of organic matter. Finally, lower RH does not restrict production of conidia, which serve as important transmission propagules. Our study suggests that lowering RH could stem infection serverity but may be of limited value as a means of mitigating pathogen dispersal from infected to healthy bats. Introduction Recent mass declines in wildlife populations attributable to pathogens are disproportionately due to mycoses (Fisher et al. 2012). White-nose syndrome (WNS) of bats, caused by the fungus Pseudogymnoacus destructans, is but an example of this disconcerting trend (Blehert et al. 2009, Frick et al. 2010, Gargas et al. 2009). To date, WNS has caused precipitous declines in bat populations, and the prognosis for Myotis lucifugus (LeConte) (Little Brown Myotis) is precarious, with regional extinction predicted by the year 2020 should declines continue at an unabated rate (Frick et al. 2010, US Fish and Wildlife Service 2015). P. destructans is classified in the family Pseudeurotiaceae (Minnis and Lindner 2013), and evidence points to the fungus reproducing asexually in North America because the population is clonal in nature (Chaturvedi et al. 2010, Khanket et al. 1Department of Biological Sciences, State University of New York at Oswego, Oswego, NY 13126. *Corresponding author: sofia.windstam@oswego.edu. Manuscript Editor: Joseph Johnson Northeastern Naturalist Vol. 24, No. 1 C.M. Marroquin, J.O. Lavine, and S.T. Windstam 2017 55 2014, Ren et al. 2012). Given that P. destructans is clonal, WNS provides an opportunity to explore factors besides pathogen genotypic variation that may contribute to lethal epidemics among bat species such as Little Brown Myotis (Langwig et al. 2012). A classical concept from plant pathology, the disease triangle, predicates that disease outcomes are dependent on the interaction between hosts, the pathogen, and the environment (Johnson et al. 2014, Scholthof 2007). Pathogen virulence is not an invariant trait disconnected from host physiology, and the disease triangle aptly takes this into account (Casadevall and Pirofski 1999, Scholtho f 2007). Temperature is an environmental factor that has profound impacts on both bat and P. destructans physiology, so much so that it has been argued that P. destructans virulence co-varies with temperature (Chaturvedi et al. 2010, Gargas et al. 2009, Langwig et al. 2012). The fungus can grow at temperatures as low as 3 °C, and the upper maximum limit for growth ranges from 19.0 to 19.8 °C depending on the isolate tested (Verant et al. 2012). The temperature optima for the P. destructans type isolate from NY (MYA-4855) range from 13.1 to 17 °C (Blehert et al. 2009, Gargas et al. 2009, Verant et al. 2012). Bats that are susceptible to WNS typically hibernate at temperatures within the growth range of P. destructans. As an example, Little Brown Myotis hibernacula temperatures range from -4 to 13 °C (Brack, 2007, Langwig et al. 2012 and references therein, Twente 1955). At these lower temperatures, bat metabolism is depressed and consequently, the immune system is also down-regulated (Luis and Hudson 2006, Prendergast et al. 2002). Further evidence corroborating the influence of temperature on virulence of P. destructans can be observed in the seasonal dynamics of bat infections. Both pathogen prevalence and infection intensity significantly increase throughout the hibernation period as low roosting temperatures prevail, to peak in late winter (Johnson et al. 2014, Langwig et al. 2015). Another important environmental characteristic for disease development is ambient moisture, but there is a paucity of data on impacts of water vapor on P. destructans and/or bat physiology. Water vapor pressure deficit (WVPD) is associated with bat hibernacula selection in Mytotis in the Upper Peninsula of Michigan, where bats were found to preferentially use hibernacula with lower WVPD (Kurta and Smith 2014). Although measuring WVPD is preferable to measuring RH, the latter is more commonly reported. Hibernacula conditions for WNS-susceptible bats ranges from 65 to 100% RH (Langwig et al. 2012, Perry 2013, Twente 1955), and correlative analysis indicates that increasing RH is associated with population declines of Myotis sodalis (Miller and Allen) (Indiana Myotis) in hibernacula where P. destructans is present (Langwig et al. 2012). However, Langwig et al. (2012) could not disentangle the effect of RH on P. destructans and/or the bats. Bat species that experience higher evaporative water losses (EWL) during hibernation are more likely to select roost sites with high moisture levels (Cryan et al. 2010). It is not unusual for bats to develop condensation on their pelage (Brack 2007, Cryan et al. 2010). Bats with condensation on the fur that also cluster together would generate a saturated atmosphere immediately surrounding the bats as equilibrium water pressure is established (Kurta 2014). Generally, bats that tend to cluster during hibernation are more susceptible to WNS than bats that do not (Cryan et al. 2010), Northeastern Naturalist 56 C.M. Marroquin, J.O. Lavine, and S.T. Windstam 2017 Vol. 24, No. 1 and bats in Northeast hibernacula post-WNS have been found to roost alone at a higher frequency when compared to pre-WNS (Langwig et al. 2012). Together, these findings suggest that higher moisture levels are more supportive of P. destructans pathogenesis. There are numerous examples of phytopathogenic fungi where infection (Abawi and Grogan 1975, Canihos et al. 1999, Obanor et al. 2008, Quinn and Powell 1982) and production of both asexual and sexual propagules are significantly related to the amount of, as well as the duration of exposure to those levels of, moisture in the air (Oh 1997, Sosa-Alvarez et al. 1995, Zhao and Shamoun 2006). It is conceivable that animal pathogenic fungi like P. destructans are similarly impacted by RH. However, most studies on WNS have been carried out at either saturation/near saturation or unspecified humidity conditions, making it challenging to deduce exactly how RH influences pathogen development (Blehert et al. 2009, Chaturvedi et al. 2010, Gargas et al. 2009, Johnson et al. 2014, Khankhet et al. 2014, Lorch et al. 2011). P. destructans growth does decrease under matric potential stress, and in the absence of any surface-tension–reducing compounds (such as lipoidal secretions on bat wing membranes), biomass production is decreased and completely ceases at -2.5 MPa and -5 Mpa, respectively (Raudabaugh and Miller 201 3). Even though P. destructans grows well under high humidity levels (Chaturvedi et al. 2010), it is not clear if lower humidity levels would impose a significant restriction on mycelial growth and/or conidiation. Some plant pathogenic fungi grow better and/or produce more propagules as RH or moisture duration increases (Sosa-Alvarez et al. 1995, Zhao and Shamoun 2006), while others have peak RH optima well below 90% RH (Oh 1997). The purpose of our study was to determine the influence of RH on P. destructans growth and development. Using humidity levels reflective of those normally encountered in bat hibernacula, we hypothesized that RH would significantly impact mycelial expansion and conidia formation, and predicted that humidity levels at the higher range (>90% RH) would support the most vegetative growth and conidiation. Methods Freeze-dried conidia of P. destructans MYA-4855 (American Type Culture Collection, Manassas, VA) were rehydrated for a period of about 6 hours and then spread-plated onto Sabouraud dextrose agar (SDA, Remel, KA) plates amended with 50 μg × ml-1 chloramphenicol and incubated at 8 °C for 4 weeks. We regularly subcultured P. destructans at 8 °C and used a 5-mm–diameter cork-borer to punch out inoculum agar plugs from the edge of the mycelial colony from 4-week–old cultures. We used agar plugs to inoculate 35-mm–diameter SDA plates for humidity bioassays. Humidity chambers were constructed by placing plexiglass platforms (20 cm × 28 cm) supported by glass cylinders in clear polystyrene boxes (31 cm × 23 cm × 10 cm; Potomac Display, Bunn, NC), and all components of the chambers were either surface disinfected with 70% ethanol or autoclaved after being washed in a 10% bleach solution. We added 400 ml of supersaturated Mg(NO3)2 × 6H2O, NaCl, KCl, or distilled sterile H2O to the bottom of each humidity chamber, resulting Northeastern Naturalist Vol. 24, No. 1 C.M. Marroquin, J.O. Lavine, and S.T. Windstam 2017 57 in an average 70.6, 81.7, 89.5, and 96.5% RH, respectively, in the different chambers (Table 1; Winston and Bates 1960). We then placed uncovered SDA plates inoculated with P. destructans on the plexiglass platforms and individual LogTag HAXO-8 loggers (MicroDaq, Contoocook, NH) in each chamber to allow for continuous measure of RH (%) and temperature (°C). A humidity chamber for each RH was incubated at 13 °C for 3 weeks, and we collected and destructively analyzed 4 replicate plates from each humidity chamber every week. We selected the bioassay temperature on the basis of it being identified as the optimum growth temperature for MYA-4855 (Verant et al. 2012). The experiment was run to completion for 3 weeks for a total of 3 times independently. We estimated vegetative growth by measuring the colony diameter to the nearest mm. When there was no confluent growth from P. destructans satellite colonies established by dispersed spores, we measured the diameter twice in directions perpendicular from each other and averaged the 2 values. Sporulation was assessed by taking a tape mount and staining conidia using lactophenol cotton blue. We counted conidia in a random field of view (FOV) at 1000× magnification and used a micrometer (American Optics, Burlington, ON, Canada) to determine the FOV diameter. The number of conidia × FOV -1 was used to extrapolate the number of spores per colony by the following formula, where rc and rFOV equals the radius of the colony and FOV, respectively: spores × colony-1 = ([π × rc 2] / [π × rFOV 2]) × sporesFOV Both the area of the colony and FOV were expressed in mm2. We replicated the experiment 3 times, and upon concluding each experimental replicate, downloaded the logger data in order to verify the actual RH and temperature in each chamber (Table 1). Minitab Express (Minitab, Inc., State College, PA) and SAS v9.4 (SAS Institute, Inc., Cary, NC) were used for all statistical analyses. First, we ran a 2-way ANOVA using either conidia count or colony diameter as the response variable and time and humidity as predictor variables. Means were separated and Tukey’s pairwise comparisons were performed. Second, we performed simple linear regressions to determine if there was a significant relationship between either conidia count or colony diameter and time or humidity. For the former predictor variable, we assayed each humidity level in isolation and for the latter predictor, we analyzed each week singly. Each experimental replicate was analyzed separately, and then the Table 1. Humidity levels and temperatures in humidity chambers averaged across the 3-week incubation period and all 3 experimental replicates. Numbers after th e ± denotes the standard error. Salt RH (%) Temperature (°C) Mg(NO3)2 70.6 ± 0.07 13.2 ± 0.007 NaCl 81.7 ± 0.06 12.9 ± 0.010 KCl 89.5 ± 0.05 11.9 ± 0.008 No saltA 96.5 ± 0.03 13.1 ± 0.008 ADistilled water used. Northeastern Naturalist 58 C.M. Marroquin, J.O. Lavine, and S.T. Windstam 2017 Vol. 24, No. 1 pooled dataset was subjected to the same analysis. Finally, we employed a regression analysis using the PROC GLM procedure and an ANCOVA analysis on the pooled data set to compare the slopes of colony diameter or conidia count versus time for different humidity levels. We created and assessed diagnostic plots (normality and equal variances) to ensure that assumptions to tests were not violated as well as to check for influential data points. Unless otherwise noted, significance means P-value ≤ 0.05 for treatment comparisons. Results Vegetative growth increased significantly with increased RH levels at 2 and 3 weeks post inoculation (WPI) on SDA plates, while there was no difference in growth after 1 week (Table 2, Fig. 1A). The r-value increased from 0.49 to 0.61 by 2 and 3 weeks of growth, respectively, indicating an increased strength in the linear relationship between humidity and mycelial growth diameter (Table 2). Examining mycelial growth for each individual humidity level over time revealed that radial expansion significantly increased over time for all RH levels, but the strength of the relationship was greater at 81.5% RH and above (r = 0.87–0.93) compared to 70% RH (r = 0.49; Table 3). The slope of the mycelial growth over time was significantly higher at 81.5 to 96.5% RH compared to 70% RH (T able 3). Table 2. Regression analysis of P. destructans vegetative growth and conidia production in response to humidity, using a pooled data set comprised of 3 experimental replicates. r = regression coefficient for response variable (“vegetative growth” and “conidia production”) in response to humidity. R2 = coefficient of determination followed by the significance of the F-test for the regression where NS = nonsignificant; *, P ≤ 0.05: **, P < 0.01; ***, P < 0.001. Vegetative growth (mm) Conidia production (log n × colony -1) Time (week) r R2 r R2 1 0.17 0.0483 (NS) 0.14 0.0194 (NS) 2 0.49 0.2384*** 0.01 0.0002 (NS) 3 0.61 0.3689*** 0.33 0.1069* Table 3. Regression and ANCOVA analysis of P. destructans vegetative growth and conidia production in response to time, using a pooled data set including data from 3 experimental replicates. r = regression coefficient for response variable (“vegetative growth” and “conidia production”) in response to time. R2 = coefficient of determination followed by the significance of the F-test for the regression where NS = nonsignificant; *, P ≤ 0.05: **, P < 0.01; ***, P < 0.001. LS mean = least-squares mean estimates from ANCOVA comparing treatment slopes, where estimates followed by different letters are significantly different. Vegetative growth (mm) Conidia production (log n × colony -1) RH(%) r R2 LS mean r R2 LS mean 70 0.49 0.2435** 18.1c 0.27 0.0706 (NS) 5.4a 81.5 0.87 0.7655*** 22.1ab 0.51 0.2638** 5.5a 89.5 0.93 0.8613*** 21.2b 0.54 0.2928*** 5.3a 96.5 0.88 0.7720*** 23.1a 0.59 0.3488*** 5.4a Northeastern Naturalist Vol. 24, No. 1 C.M. Marroquin, J.O. Lavine, and S.T. Windstam 2017 59 Fungal conidia production was less influenced by variation in RH within the range tested (70.5 to 96.5%; Table 3, Fig. 1). There was no significant linear relationship between humidity and sporulation level by 2 WPI (Table 2, Fig. 1B). By 3 WPI, higher RH levels were correlated with increased conidia production (r = 0.33). It was found that increasing the humidity from 70 to 81.5% was primarily responsible for this linear relationship (Table 2, Fig. 1B). Conidia production in- Figure 1. Vegetative growth and conidia production of P. destructans over time at different humidity levels. (A) The fungal colony diameter in response to humidity (%) assessed at 1 (■), 2(□), and 3 (▲) weeks post-inoculation. (B) Fungal conidia production (log n × colony-1) at 70-96.5% humidity at 1, 2, and 3 WPI. The figure is based on a pooled data set from 3 experimental replicates. Each marker or bar is the mean of 12 replicates (except for 3 where 1 data point was omitted due to contamination), and err or bars are the standard error of the mean. Northeastern Naturalist 60 C.M. Marroquin, J.O. Lavine, and S.T. Windstam 2017 Vol. 24, No. 1 creased significantly over time at 81.5 to 96.5% RH, whereas no such relationship was denoted for 70% RH (Table 3). Despite these differences, the slope of conidia increases were similar for all relative humidities, and the strength of the linear response was low at 81.5 to 96.5% RH ( r = 0.51–0.59). Discussion Increasing moisture levels yielded a concomitant increase in the mycelial expansion of P. destructans, as initially predicted (Fig. 1A, Table 2). However, RH levels of 81.5% result in similar vegetative growth rates to the rates at 89.5 and 96.5% RH (Table 3). This was somewhat surprising, as our prediction was that RH >90% would be most supportive of growth. Also contrary to our hypothesis, conidiation was not affected by the RH, at least not using the range of moistures at 13 °C in this study (Fig. 1B, Table 3). Mycelial expansion is an important determinant for P. destructans pathogenesis, and reduced mycelial growth may impart a reduced risk for bats developing substantial infections. Most caves in the Northeast where bats hibernate have relative humidities that range from 60 to 100% (Langwig et al. 2012, Perry 2013), which means that some hibernacula or microclimates therein would be less supportive of mycelial growth than others. Our data suggests that microclimates of 70% RH and 13 °C are significantly less supportive of P. destructans growth than those with higher RH at that temperature (Table 3, Fig. 1). Bats can hibernate over a range of temperatures, but prefer temperatures less than 13 °C, which hold less ambient moisture than air at 13 °C, even at the same RH (Brack 2007, Kurta 2014, Kurta and Smith 2014). Thus, 70% RH at temperatures below 13 °C would likely support even less mycelial growth. Water vapor pressure (WVP), which takes into account both temperature and ambient moisture, is a metric that is reflective of absolute moisture level in the air, and the resulting saturation water vapor pressure (SWVP) varies with temperature (Kurta 2014). As temperatures in hibernacula are expected to vary over the course of hibernation, SWVP will also fluctuate. Hence, WVP and SWVP will be more appropriate measures in future studies seeking to examine the role of moisture on P. destructans development in situations reflective of a natural setting. In this study, P. destructans was held at a constant temperature, allowing us to directly compare impact of differing moisture levels, as reflected in RH readings, on fungal growth and development. Caves with higher humidities provide P. destructans with a greater potential to cause mortality in bat species that exhibit a preference for such relatively humid hibernacula (Wilder et al. 2011). Also, biomass production of P. destructans is sensitive to water stress, and lower matric potentials of -5MPa completely abolishes mycelial expansion (Raudabaugh and Miller 2013). Surface-tension–reducing materials, such as fats secreted on wing membranes, can allow the fungus access to water (Raudabaugh and Miller 2013), but paradoxically, some fatty acids present on bat wings can also inhibit P. destructans growth (Frank et al. 2016). At temperatures of 10.5 to 13.4 °C, similar to that employed in this study, myristic acid and stearic acids constrained colony expansion (Frank et al. 2016). Northeastern Naturalist Vol. 24, No. 1 C.M. Marroquin, J.O. Lavine, and S.T. Windstam 2017 61 It was somewhat surprising that the tested RH levels did not impact P. destructans conidiation, as there are numerous examples of phytopathogenic fungi for which altering moisture levels results in concomitant changes in sporulation (Oh 1997, Sosa-Alvarez et al. 1995, Zhao and Shamoun 2006). For example, Uncinula necator produced the most conidia at 75.6% RH on grapevine hosts, regardless of the tested temperature (Oh 1997). Conidia serve as important transmission propagules and can initiate infections of healthy bats (Lorch et al. 2011). Our data suggests that mitigating transmission rates during an ongoing WNS outbreak in a hibernaculum by manipulating RH would be of limited value as it would not suppress conidia production substantially unless the humidity is below levels not included in this study. However, the lowest RH tested, 70%, is close to the lower range of RH encountered at bat hibernacula (60–65%; Langwig et al. 2012, Perry 2013); thus it is questionable whether such a small RH reduction would have a significant impact on overall conidia production. Furthermore, considering that many bat species preferentially hibernate in sites with more moisture, presumably as a means to alleviate EWL, reductions in RH would also be harmful for overwintering bats already faced with significant water loss (Cryan et al. 2010, Kurta and Smith 2014). Bats typically do not hibernate at 13 °C, the temperature that was used in this study, and as mentioned above, at lower temperatures the moisture content at the same RH will be lower (Brack 2007, Kurta and Smith 2014, Twente 1955). Bats are vulnerable to dehydration during torpor due to EWL, which probably explains why humidity is an important factor for bat hibernacula selection (Cryan et al. 2010, Kurta and Smith 2014, Perry 2013). By selecting hibernacula or sites within hibernacula with higher humidity, and by clustering, bats may reduce the amount of water loss through wing and lung membranes (Cryan et al. 2010, Willis et al. 2011). For bats that aggregate in larger clusters and experience high enough EWL to generate condensation on the fur, there will be a saturated atmosphere surrounding such clusters. This effect is due to equilibrium water pressure being reached, and without significant air flow, this atmosphere would be supportive of P. destructans mycelia growth, regardless of overall hibernacula RH (Hayman et al. 2016, Kurta 2014, Radabaugh and Miller 2013). Interestingly, a behavioral adaptation and/or selection denoted in post-WNS populations of Little Brown Myotis is an increased frequency of bats hibernating in smaller groups (Wilcox et al. 2014), which could decrease RH within a bat aggregate because fewer bats clustering together would yield a lower volume of condensed water on the fur . Some Little Brown Myotis populations initially decimated by P. destructans seem to be rebounding from the WNS epidemic waves (Lilley et al. 2016). The bats that are remaining in these surviving populations have a lower arousal frequency than bats during peak WNS that is more similar to frequencies observed pre-WNS. Similarly, bat torpor temperatures post-WNS in these renewed populations are also lower than during peak WNS and more similar to pre-WNS temperatures, and lower temperatures does retard P. destructans vegetative growth (Chaturvedi et al. 2010, Lilley et al. 2016, Verant et al. 2012). Modeling of WNS impacts in bat populations articulates the importance of both temperature Northeastern Naturalist 62 C.M. Marroquin, J.O. Lavine, and S.T. Windstam 2017 Vol. 24, No. 1 and moisture in understanding disease outcomes (Hayman et al. 2016). High humidity was anticipated to increase fungal growth and lead to more frequent arousals, which in turn was a predictor of bat mortality (Hayman et al. 2016). Taken together, these more recent findings underscore the importance of considering how environmental parameters influence both bat and fungal physiology and how these conspire to generate disease outcomes. Acknowledgments The authors thank the State University of New York at Oswego Scholarly and Creative Activities Committee for funding the study. The authors also thank the University for the legal assistance required to secure the Pseudogymnoacsus destructans isolate from ATCC. Literature Cited Abawi, G.S., and R.G. Grogan. 1975. Source of primary inoculum and effects of temperature and moisture on infection of beans by Whetzelinia sclerotiorum. Phytopathology 65:300–309. Blehert, D.S., A.C. Hicks, M. Behr, C.U. Meteyer, B.M. Berlowski-Zier, E.L. Buckles, J.T.H. Coleman, S.R. Darling, A. Gargas, R. Niver, J.C. Okoniewski, R.J. Rudd, and W.B. Stone. 2009. Bat white-nose syndrome: An emerging fungal pathogen? Science 323:227–227. Brack, V., Jr. 2007. Temperature and locations used by hibernating bats, including Myotis sodalist (Indiana bat), in a limestone mine: Implications for conservation and management. Environmental Management 40:739–746. Canihos, Y., T.L Peever, and L.W. Timmer. 1999. Temperature, leaf wetness, and isolate effects on infection of Minneola tangelo leaves by Alternaria sp. Plant Disease 83:429–433. Casadevall, A., and L-A. Pirofski. 1999. Host-pathogen interactions: Redefining the basic concepts of virulence and pathogenicity. Infection and Immunity 67:3703–3713. Chaturvedi, V., D.J. Springer, M.J. Behr, R. Ramani, X. Li, M.K. Peck, P. Ren, D.J. Bopp, B. Wood, W.A. Samsonoff, C.M. Butchkoski, A.C. Hicks, W.B. Stone, R.J. Rudd, and S. Chaturvedi. 2010. Morphological and molecular characterizations of psychrophilic fungus Geomyces destructans from New York bats with white nose syndrome (WNS). PLoS One 5:e10783. Cryan, P. M., C.U. Meteyer, J.G. Boyles, and D.S. Blehert. 2010. Wing pathology of whitenose syndrome in bats suggests life-threatening disruption of physiology. BMC Biology 8:135. Fisher, M.C., D.A. Henk, C.J. Briggs, J.S. Brownstein, L.C. Madoff, S.L. McCraw, and S.J. Gurr. 2012. Emerging fungal threats to animal, plant, and ecosystem health. Nature 484:186–194. Frank, C.L., M.R. Ingala, R.E. Ravenelle, K. Dougherty-Howard, S.O. Wicks, C. Herzog, and R.J. Rudd. 2016. The effects of cutaneous fatty acids on the growth of Pseudogymnoascus destructans, the etiological agent of white-nose syndrome. PLoS ONE 11:e0153535. Frick, W.F., J.F. Pollock, A.C. Hicks, K.E. Langwig, D.S. Reynolds, G.G. Turner, C.M. Butchkoski, and T.H. Kunz. 2010. An emerging disease causes regional population collapse of a common North American bat species. Science 329:679–682. Gargas, A., M.T. Trest, M. Christensen, T.J. Volk, and D.S. Blehert. 2009. Geomyces destructans sp. Nov. associated with bat white-nose syndrome. Mycotaxon 108:147–15 4. Northeastern Naturalist Vol. 24, No. 1 C.M. Marroquin, J.O. Lavine, and S.T. Windstam 2017 63 Hayman, D.T.S, J.R.C. Pulliam, J.C. Marshall, P.M. Cryan, and C.T. Webb. 2016. Environment, host, and fungal traits predict continental-scale white-nose syndrome in bats. Science Advances 2:e1500831. Khankhet, J., K.J. Vanderwolf, D.F. McAlpine, S. McBurney, D.P. Overy, D. Slavic, and J. Xu. 2014. Clonal expansion of the Pseudogymnoascus destructans genotype in North America is accompanied by significant variation in phenotypic expression. PLoS ONE 9:e104684. Kurta, A. 2014. The misuse of relative humidity in ecological studies of hibernating bats. Acta Chiropterologica, 16:249–254. Kurta, A., and S.M. Smith. 2014. Hibernating bats and abandoned mines in the upper peninsula of Michigan. Northeastern Naturalist, 21:587–605. Johnson, J.S., D.M. Reeder, J.W. McMichael III, M.B. Meierhofer, D.W. Stern, S.S. Lumadue, L.E. Sigler, H.D. Winters, M.E. Vodzak, A. Kurta, J.A. Kath, and K.A. Field. 2014. Host, pathogen, and environmental characteristics predict white-nose syndrome mortality in captive Little Brown Myotis ( Myotis lucifugus). PLoS One 9(11):e112502. Langwig, K.E., W.F. Frick, J.T. Bried, A.C. Hicks, T.H. Kunz, and A. Marm Kilpatrick. 2012. Sociality, density-dependence, and microclimates determine the persistence of populations suffering from a novel fungal disease, white-nose syndrome. Ecology Letters 15:1050–1057. Langwig, K.E., W.F. Frick, R. Reynolds, K.L. Parise, K.P. Drees, J.R. Hoyt, T.L. Cheng, T.H. Kunz, J.T. Foster, and A.M. Kilpatrick. 2015. Host and pathogen ecology drive the seasonal dynamics of a fungal disease, white-nose syndrome. Proceedings of the Royal Society B 282 DOI:10.1098/rspb.2014.2335. Lilley, T.M., J.S. Johnson, L. Ruokolainen, E.J. Rogers, C.A. Wilson, S.M. Schell, K.A. Field, and D.M. Reeder. 2016. White-nose survivors do not exhibit frequent arousals associated with Pseudogymnoascus destructans infection. Frontiers in Zoology 13:12. Lorch, J.M., C.U. Meteyer, M.J. Behr, J.G. Boyles, P.M. Cryan, A.C. Hicks, A.E. Ballmann, J.T.H Coleman, D.N. Redell, D.M. Reeder, and D.S. Blehert. 2011. Experimental infection of bats with Geomyces destructans causes white-nose syndrome. Nature 480:376–378. Luis, A.D., and P.J. Hudson. 2006. Hibernation patterns in mammals: A role for bacterial growth? Functional Ecology 20:471–477. Minnis, A.M., and D.L. Lindner. 2013. Phylogenetic evaluation of Geomyces and allies reveals no close relatives of Pseudogymnoascus destructans, comb. nov., in bat hibernacula of eastern North America. Fungal Biology 117:638–649. Obanor, F.O., M. Walter, E.E. Jones, and M.V. Jaspers. 2008. Effect of temperature, relative humidity, leaf wetness, and leaf age on Spilocaea oleagina conidium germination on olive leaves. European Journal of Plant Pathology 120:21 1–222. Oh, J.-H. 1997. Effects of temperature, relative humidity, pH, and triazole fungicides on sporulation and conidial germination of Uncinula necator. Korean Journal of Plant Pathology 13:210–214. Perry, P.W. 2013. A review of factors affecting cave climates for hibernating bats in temperate North America. Environmental Reviews 21:28–39. Prendergast, B.J., D.A. Freeman, I. Zucker, and R.J. Nelson. 2002. Periodic arousal from hibernation is necessary for initiation of immune responses in ground squirrels. American Journal of Physiology 282:R1054–R1062. Quinn, J.A., and C.C. Powell Jr. 1982. Effects of temperature, light, and relative humidity on powdery mildew of begonia. Phytopathology 72:480–484. Northeastern Naturalist 64 C.M. Marroquin, J.O. Lavine, and S.T. Windstam 2017 Vol. 24, No. 1 Raudabaugh, D.B., and A.N. Miller. 2013. Nutritional capability of and substrate suitability for Pseudogymnoascus destructans, the causal agent of bat white-nose syndrome. PLoS One 8:e78300. Ren, P., K.H. Haman, L.A. Last, S.S. Rajkumar, M.K. Keel, and V. Chaturvedi. 2012. Clonal genotype of Geomyces destructans among bats, midwestern and southern United States. Emerging Infectious Diseases 18:883–885. Scholthof, K.-B. 2007. The disease triangle: Pathogens, the environment, and society. Nature Reviews in Microbiology 5:152–156. Sosa-Alvarez, M., L.V. Madden, and M.A. Ellis. 1995. Effect of temperature and wetness duration on sporulation of Botrytis cinerea on strawberry leaf residues. Plant Disease 79:609–615. Twente J.W., Jr. 1955. Some aspects of habitat selection and other behavior of caverndwelling bats. Ecology 36:706–732. US Fish and Wildlife Service. 2015. Bat white nose syndrome: The devastating disease of hibernating bats in North America. Available online at https://www.whitenosesyndrome. org/sites/default/files/resource/white-nose_fact_sheet_11_2015.pdf. Accessed 12 January 2016. Verant M.L., J.G. Boyles, W. Waldrep, G. Wibbelt, and D.S. Blehert. 2012. Temperature-dependent growth of Geomyces destructans, the fungus that causes white-nose syndrome. PLOS One 7:e46280. Wilcox, A., L. Warnecke, J.M. Turner, L.P. McGuire, J.W. Jameson, V. Misra, T.C. Bollinger, and C.K.R. Willis. 2014. Behaviour of hibernating little brown bats experimentally inoculated with the pathogen that causes white-nose syndr ome. Animal Behaviour 88:157–164. Wilder, A.P., W.F. Frick, K.E. Langwig, and T.H. Kunz. 2011. Risk factors associated with mortality from white-nose syndrome among hibernating bat colonies. Biology Letters 7:950–953. Willis, C. K., A.K. Menzies, J.G. Boyles, and M.S. Wojciechowski. 2011. Evaporative water loss is a plausible explanation for mortality of bats from white-nose syndrome. Integrative and Comparative Biology 51:364–373. Winston, P.W., and D.H. Bates. 1960. Saturated solutions for the control of humidity in biological research. Ecology 41:232–237. Zhao, S., and S.F. Shamoun. 2006. The effects of culture media, solid substrates, and relative humidity on growth, sporulation, and conidial discharge of Valdensinia heterodoxa. Mycological Research 110:1340–1346.